WILSONVILLE, OR--(Marketwire - October 25, 2010) - Mentor Graphics Corporation (NASDAQ: MENT) today announced industry-first capabilities in the next generation of its FloTHERM® 3D computational fluid dynamics (CFD) software for electronics cooling applications. The patent-pending technology in the FloTHERM software provides Bottleneck (Bn) and Shortcut (Sc) fields so that, for the first time, engineers can now identify where heat flow congestion occurs in the electronic design and why. It also identifies thermal shortcuts to quickly and efficiently resolve the design problem. Together, the Bn and the Sc fields elevate the use of simulation from an observation tool which identifies heat management problems to an effective thermal design problem-solving tool which suggests potential solutions to the designer. 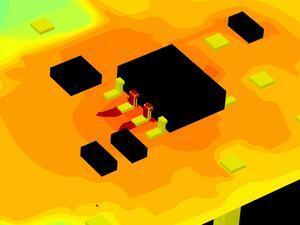 The end result is faster and more efficient resolution of heat management problems. "The value of FloTHERM 9 is in the time and the cost it saved us when developing an IC for a new generation of Energy Star-compliant mobile phone chargers. The baseline simulation using the 'bottleneck' feature quickly highlighted a potential thermal issue, and further iterations confirmed our solution," stated Nigel Heather, vice president of engineering, CamSemi. "To achieve the same result by building prototype boards would have taken a long time and drawn resources away from other critical work. FloTHERM has helped us reduce development costs and kept our project on track to meet our customer's aggressive deadline." For years, the FloTHERM software has been the industry leader in thermal analysis, used worldwide as a fast and accurate computational fluid dynamics solver. FloTHERM software reduces thermal verification by 33% and reduces PCB design re-spins by 500% compared to other solutions, according to a survey conducted by the Aberdeen Group (Electronics Correct by Design Benchmark Study, February 2007). These innovations position FloTHERM to revolutionize the way designers solve their heat management challenges. The Bn field shows where in a design the heat path is being congested as it attempts to flow from high junction temperature points to ambient. Design changes to these bottlenecks can help solve the heat flow problem. The Sc field highlights possible solutions where the addition of a simple element to the design will provide a new effective heat flow path to further cool the system. Using these two new technologies in conjunction with FloTHERM's classic thermal analysis will enable designers to more quickly arrive at a better solution. Instead of experimenting with trial and error solutions, they will be guided with intelligent suggestions based on the Bn and Sc fields. "Mentor's focus on solving the electronics industry's IC and systems power dissipation problems extends through the entire flow," stated Erich Buergel, general manager, Mentor Graphics Mechanical Analysis Division. "By providing thermal simulation and testing solutions which span the entire process -- starting with ICs and packages, through to PCBs and finally the complete electronic system -- we are addressing the entire spectrum of the problem. Now this new Bn and Sc technology adds a new dimension to our solution." Two additional enhancements have been made in the new FloTHERM v.9 product: XML model and geometry data importing to enable FloTHERM integration into existing data flows, and a direct interface to the Mentor Graphics® Expedition® PCB design platform. The direct interface enables users to import native Expedition PCB data, and delete or edit additional objects (heatsinks, thermal vias, board cutouts, EM cans) for more accurate thermal model design development. The FloTHERM product allows engineers to implement virtual prototypes using advanced CFD techniques to simulate airflow, temperature and heat transfer in electronic systems. This capability enables accurate thermal analysis so engineers can evaluate and test designs automatically before physical prototypes are built. The FloTHERM software is compatible with other Mentor products to provide comprehensive thermal simulation for optimum system reliability, from IC package to PCB and full system development. The FloTHERM v.9 product is available for immediate shipment. For product pricing, contact your local Mentor Graphics representative or distributor or call 800-547-3000. For further product information or to view an online product demo, visit the website at http://www.mentor.com/products/mechanical/products/flotherm. (Mentor Graphics, FloTHERM, and Expedition are registered trademarks of Mentor Graphics Corporation. All other company or product names are the registered trademarks or trademarks of their respective owners). Original thermal bottleneck field in the CamSemi mobile charger as identified by FloTHERM.